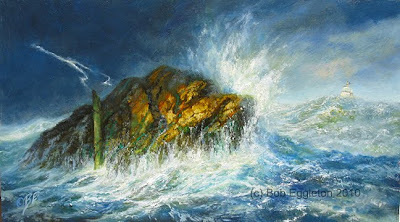 The Sea That Tells The Tale (9x18 inches oils). I did this as one of two paintings for a Newport RI gallery show. Small works, and I always love painting the ocean and shores, in sort of a romantic way. That is, I tend to make up alot of it based on years of having seen oceans. Anyway, this is a piece done in a day, that has a cautionary tale to tell. If it does not sell in the gallery, it shall be posted back here again! I love this!!!! I'm a fantasy writer myself, with particular emphasis in elements and landscapes, and this is very appealing/inspiring!